CLIENT: Boston Properties. Rudin Development. SCOPE OF WORK: Architecture. SIZE: 675 000 SF. LOCATION: 67 Flushing Ave. Brooklyn, NY. STATUS: Under construction. TEAM: Design Architect: S9 Architecture. Managing Architect: Perkins Eastman. Structural Engineer: Arup. MEP / FP: Cosentini. Civil Engineer: Langan. Landscape Design: MPFP. AWARDS: Excellence in Design Award. New York City Public Design Commission. 2016. NYC X Design On the Boards Award. 2016. 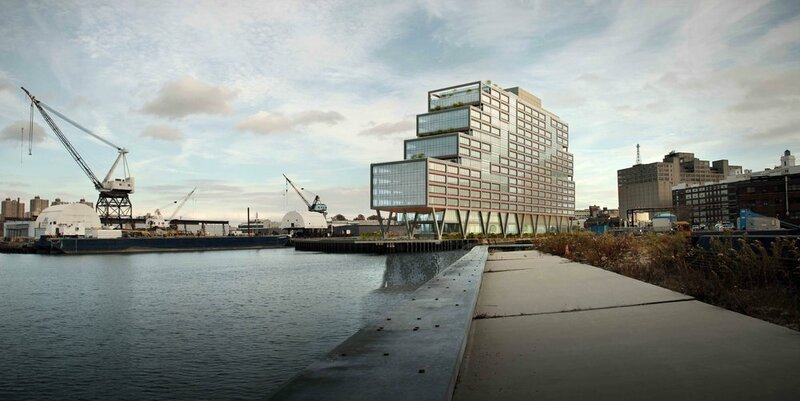 Dock 72 is a 16-story, 650,000 sf mixed-use office building designed in response to the way people work today, and sited in the heart of the Brooklyn Navy Yard, a 300-acre former shipyard and industrial park, reimagined as an anchor of Brooklyn’s Tech Triangle. A locus of creativity, entrepreneurship, and modern industry in New York, the Brooklyn Navy Yard is home to over 300 local businesses generating more than $2B of revenue annually. More than a vanguard office building, Dock 72 is an inspiring workplace environment and incubator at the center of the emerging industries that are defining New York’s future. Developed in conjunction with co-working pioneers WeWork, as well as Boston Properties and Rudin Development, Dock 72 adds 450,000 sf of modern commercial and light industrial space to the Navy Yard’s existing mix of creative and manufacturing enterprises, and will be the largest New York City commercial building built outside of Manhattan in decades. WeWork will occupy approximately 140,000 - 175,000 sf as the anchor tenant. The first floor will serve as a marketplace and lounge open to the entire building. The second floor will have a lounge and juice bar as an extension of the lobby with bleacher seating above. A gym will also be occupy the second floor with membership for building tenants. The 16th floor will house a 10,000 sf conference space with a kitchen and both indoor and outdoor lounges. S9 Architecture envisioned Dock 72 as a modern office building that venerates the legacy of labor forged at Brooklyn’s historic Navy Yard, while looking ahead to foster the tech, manufacturing, and creative sectors that have rebirthed 21st century industry in Brooklyn. Innovation and collaboration continue to drive the explosive growth of these industries worldwide. Dock 72 is designed to harness the power of these forces by organically facilitating cross-pollination, networking, and idea sharing through serendipitous encounters between the diverse community of startups, creative, and small businesses who share workspace there.
" “This project is going to help bring ideas, innovators, and start-ups to the Yard, where they can scale up their businesses, hire more New Yorkers, and manufacture their products right here in Brooklyn,” said Mayor Bill de Blasio in a statement.